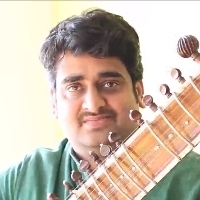 Vishal Mishra is the 7th generation musician from Banaras music family. His training started when he was born because everyone at his home has a music background. He was trained under Ustad Shujaat Hussain Khan. He has been playing since 2000. Playing Sitar is classical Indian music instrument. Its One of the most renowned Indian musical instrument. "I started playing sitar at the age of 12. I am also a vocalist. Professionally, I started playing sitar in 2000."